IP3: > +30 dBm Typ. IP2: > +50 dBm Typ. When space is at a premium or you live in an area where an antenna is considered anti social the new GigActiv GA3005 is the ideal solution for the avid listener with a wide band receiver. 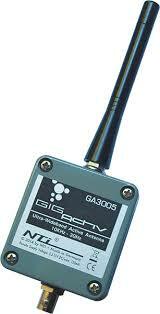 The low noise GIGACTIV 3005 Ultra Wide band Active Antenna by NTi covers the whole frequency range from 9 kHz – 3 GHz. The receiving element measures only 10 cm long and so the unit can be erected very discretely. The antenna requires a voltage of 5,5 – 15V direct current (max. 120mA) fed through coax via the supplied DC interface . There is also available 5V USB cable power supply module. This is perfect for mobile use with a PC powering the unit (at the lower voltage there is a slight reduction in performance but still maintaining short wave around 7 MHz and above 200 MHz the antenna achieves an IP of typically >+30dBm). Power supply via optional USB-Junction Box available. (This reduces existing interference significantly).